This brand new villa was finished in 2007 to high specifications. It offers sea and golf views from 3 terraces on the first floor, with two en-suite bedrooms. The spacious lounge-dining over two levels would easily convert into a fourth bedroom, with its own terrace. Cream marble floors throughout, kitchen with direct access to the terrace and a spacious lounge with a fire place as well as extensive gardens, BBQ and private pool, and a carport for three cars are just some of the attractive features. 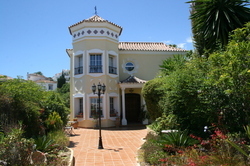 Golf courses, tennis courts, sandy beaches, airport and the vacation resort town of Marbella are all within easy reach. This villa is situated in Forest Hills, a quiet urbanization opposite the well-known Hotel Kempinsky and to the famous shopping centre Laguna Village. The villa comprises of three bedrooms, two bathrooms, a living-/ dining-room with a fireplace and a fully fitted kitchen. Furthermore there is a guest house of about 35 m² that comprises of one bedroom, one bathroom and a living-room with a fully fitted kitchen. Both the villa and the guest house dispose of air condition, heating and double glazing and there is also a safe and an alarm system. The garden is endued with a sprinkler system and the building of a pool is planned and authorized. The villa and the guest house are offered completely furnished. This new and comfortable country style villa is built on a plot of land of over 10000 m2 and is surrounded by the beautiful forest of Casares. Entering the grand gates, there is a beautiful and very well maintained garden which is accessible throughout the property. The main house consists of 3 bedrooms and 2 bathrooms, a beautiful bright and spacious living room, and a kitchen that offers you the possibility to create your own design. Next to the main house there is a small cottage which consists of a bedroom, a bathroom with shower, a kitchen, and a living-room. This tastefully decorated home with unobstructed views over the dramatic countryside makes a dream home for nature lovers. Furthermore there is room to construct your own private pool and a large garage. This property is the exception to the rule. It combines all important characters of an outstanding property such as a great location, a private and beautiful garden, a private parking, a pool and barbecue area, separate apartment, several terraces and a lot of charms. Designed and built by a Dutch architect, this property was built in 1972 will a high quality standard. The property is all on one level and provides many possibilities to make individual changes up to your own desire. Now! Bargain! Price reduced from 799,000.—EUR to 550,000.—EUR! Fantastic South-West facing furnished villa with 3 bedrooms, 3 bathrooms – two of which are en-suite, with unobstructed sea and mountain views. Entrance floor comprises of an open plan lounge and dining area, one bedroom en suite, large kitchen and breakfast room and a guest toilet. On the first floor the Master bedroom and bathroom have access to a large spacious terrace with commanding coastal views, whilst there is also a third bedroom and bathroom. Finished to a very high quality in rustic style other features include: fireplace in lounge, terracotta flooring with marble inlays, pre-installed alarm system, a high quality German kitchen, cream marble bathrooms, air-conditioning h/c as well as under floor heating in the bathrooms. The lovely garden boasts a swimming pool, an automatic sprinkler system and a garage. This is a lovely family villa with three good sized bedrooms, all with en-suite bathroom facilities. The villa has a fully fitted modern kitchen with marble worktops. The living dining area is a perfect size for family living and dining and has a wood burning fireplace for those cosy winter evenings. The living area opens onto a generous patio with direct access to the garden and pool. There is plenty of outdoor living space and from both the garden and bedroom terraces there are great views of the golf course. There is a large basement ideal for a games or cinema room. This is a very well proportioned villa with spacious living and outdoor areas situated very close to local restaurants and all amenities. An ideal home for holidays or all year living. REDUCED FROM € 760.000 TO € 575.000! This recently finished property is situated directly on one of the most beautiful beaches, the “Golden Beach”. The access to the villa built on two levels is through a small private street on the second line to the beach. From the very bright living area you have access to the terrace and the garden. A very modern kitchen – fitted to the highest standards – is also a part of living- and dining area. The upper floor consists of several bedrooms and bathrooms and a big roof terrace with stunning views to the Marbella coast and the Mediterranean Sea. Attractive features like heating and air conditioning systems, double glazing, fireplace, storage room, car port as well as a breakfast terrace are part of the sunny property. As a permanent home or just as a holiday residence this property is a top investment and perfectly situated at only 10 min. from Marbella town centre! This good quality south facing villa, is situated at the end of a quiet Cul-de-Sac in a popular area of Calahonda. It offers well planned living spaces, a large and complete equipped kitchen with sea views, a spacious lounge-dining with a chimney and a en-suite bedroom downstairs. Two bedrooms upstairs enjoy plain south-facing sea views, as does the spacious master en-suite with its huge terrace. In the spacious grounds enjoying all day sun you find next to the private pool a covered bar area and an outdoor Jaccuzzi as well as large wooden pergola providing shade during the hot summer days. The gated driveway provides additional parking for 2-4 cars in addition to a garage. Key features are electronic gates, marble floors, high ceilings, fitted wardrobes with walk in wardrobe in master bedroom. REDUCED FROM € 695.000 TO € 595.000! Nice private south facing villa in Elviria situated on an elevated plot with fantastic panoramic sea views located close to all amenities, banks, restaurants and bars. The small hallway with a guest toilet leads to a bright and spacious lounge with open fireplace and views over the covered terrace, tropical gardens with a large swimming pool to the Mediterranean. A kitchen-diner is on the same level and can be integrated into the living area. 4 bedrooms and two bathrooms are located on the upper floor. 2 bedrooms share a large glazed terrace, ideal to enjoy the winter sun and views down to Gibraltar. Further features include marble floors, individually controlled A/C, gas heating in living room, well maintained garden with BBQ and Gazebo, an ample double garage and an individual studio apartment next to the garage. This charming property is situated in the established residential area of Atalaya Park, close to San Pedro and about ten minutes drive from Puerto Banús, the famous marina of Marbella. The villa comprises of 3 bedrooms, 3 bathrooms and a guest toilet, a fully fitted kitchen and a living-room with dining-area. Features comprise air conditioning and marble floors throughout. The upper terraces overlook the well-kept tropical private garden and pool area and offer beautiful views of the mountains. With its barbecue area and double garage this property makes both a perfect permanent family home and a great holiday residence. 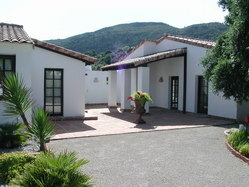 Mijas Golf Villa set within a good sized southwest facing plot. This spacious villa offers 4 large bedrooms all with en-suite bathrooms, large kitchen with eating area and an open plan lounge, living and dining area. This bright property opens out onto a large covered terrace with built in barbeque area which then leads to a private garden and pool. The property offers great family living space, has a grand entrance hall and is fitted with good quality fixtures and fittings.There is also a large double garage and is on a quiet cul de sac in the much sought after area of Mijas Golf. This Spanish style villa is situated within a lovely secured urbanisation in the residential area of Marbella Country Club. The villa comprises of three bedrooms, two bathrooms, a fully fitted kitchen, a living-/ dining-room with a fireplace and a covered terrace. The south-facing house is surrounded by a beautiful mature garden with old trees and a very nice and private pool area. The carport offers parking space for two cars and there is plenty of room for a double garage. With a little bit of refurbishment this property makes the ideal family home. This newly reformed villa will be completed in 2009 and is set on a good sized plot in the established residential community of Elviria with beautiful views to the coastline of the Mediterranean. Just minutes drive away from the only white sand beaches on Costa del Sol. The villa comprises 3 bedrooms and 3 bathrooms and will be finished with high quality fixtures and fittings. The bright spacious living room has direct access to the south facing terraces and other features include cream marble floors throughout, alarm system, A/C hot and cold, a spacious garage and connections for television and telephone. Priced to sell, an absolute gem!! Located only minutes from the lovely beach of Elviria, 200 meters from a brand new commercial centre and English and Spanish schools only 5 minutes away, this beautiful villa comprises the best of living in Marbella. The distribution of the villa is well thought out and there are several terraces and porches to enjoy the sun. 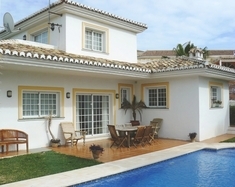 With 4 bedrooms, large living, TV-room, entertainment area with pool billiard, saltwater pool, glass curtains on the main terrace, design kitchen, wooden flooring, open-fireplace in the living room, separate A/C in all the rooms and lots of other extra´s, one will enjoy this villa all year round. The finishing are of luxurious materials and no afford is spared to make this a great place to live. Detached 4 bedroom family home, located in Marbesa, a quiet urbanization East of Marbella, within walking distance to one of the best beaches. Built on two levels, this villa is finished to high standards. The main level comprises an open plan lounge with fireplace and open connection to the equipped kitchen and dining area. Two bedrooms with two en-suite bathrooms are on the same level. Double sliding doors lead to a porch which offers sea views, pool and gardens. The upper level consists of a master-suite with Jacuzzi bath, shower and dressing area and two large terraces with sea views. The basement offers a separate guest apartment with little kitchenette. A carport for two cars is part of the property. This well-kept and charming villa has been built in 1998 on two levels and best building qualities. It is situated very centrally and in a very quiet area and it is orientated to the south west. The living room includes a fireplace; the kitchen is fully fitted and has a breakfast area, the bedrooms have bathrooms en suite, there are terracotta flooring’s throughout and it is a garage. The layout is practical and this property is an ideal residence to spend the whole year enjoying the Andalusian sun. This exciting villa with stunning mountain views is located only 10 minutes drive from the lovely beaches of Elviria.. Its extensive gardens are very well groomed and the pool provides a lot of privacy. The ground floor includes a specious kitchen and an adjoining terrace. The living area complete with an open fireplace. The villa boasts 5 bedrooms and 3 bathrooms. Further quality features are: rustic stone floors, alarm system, air-condition hot and cold, double glazing, and a spacious garage. 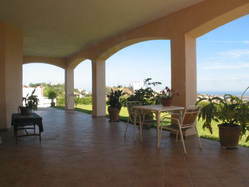 If you are looking for great views, tranquillity, then this villa is a must-see!! A sauna has been installed seperatley in the garden. Price reduced from 895,000€ to 750.000€.This new property is situated in a peaceful and quiet residential area close to Marbella Center with its fantastic shopping possibilities, restaurants and the beautiful old town. From the terraces you can enjoy views to the mountain and the Mediterranean sea. 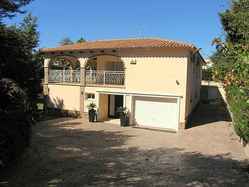 This villa ordered two levels and offers additional a big basement for a separate guest-apartment, a party- or fitnessroom or three carplaces. The house is unfurnished, has an open fire place in the living room and the floors are moved with marble. The color-character of the house is painted in yellow and beige. The price of this new villa, the community fee and tax comes highly recommended for a family-living home. This estate was built in 2002 with only the best materials and boasts beautiful views towards the sea and the mountains as well as generous terraces to all sides of the villa. Features are marble floors, air-conditioning h/c, satellite tv, ADSL, solar panels, a fully fitted kitchen, a fireplace in the living room as well as double glazed windows and an alarm system. The basement of approx. 42 m² is perfect as a gym or for an individual use. In the well-kept garden of approx. 635 m² is a possibility to built a swimming pool. In front of the house is a parking space for 3 cars. The villa is offered unfurnished. 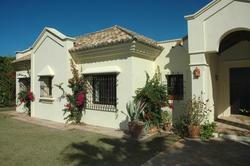 Beautiful, well maintained villa in the heart of Sotogrande Alto. This south facing villa, with views to the San Roque golf course, is situated in a very quiet street and has a spacious garden with private swimming pool. As an extra, you can enjoy summer evenings sitting on your covered terrace with a glass of wine. The villa spans over three levels and is located in famous area of Calahonda with south orientation and wonderful sea views. The ground floor features a a modern and complete equipped kitchen, a guest toilet, a living room with a cosy fire place and a separate dining area. The first floor dispose three bedrooms and two bathrooms, as well as a roof solarium on the top floor. The residence contains air condtioning, double glazing and wooden floors throughtout. The well maintained garden and the private Pool, completes the lovely domicile. This magnificent villa has been built on one level and has been finished in 1999. It is located in a privileged area between the famous Valderrama golf course, La Reserva and Almenara, near the international school of Sotogrande and the Almenara Hotel. The beautiful living room includes a fireplace, the large kitchen is fully equipped, there are four bedrooms and three bathrooms, guest toilet, air conditioning, hot / cold, under floor heating, marble and terracotta floors, a pool, open and covered terraces and a carport. An ideal residence in the sunny south. 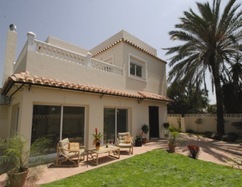 At a mere 10 minutes driving from both Marbella and Puerto Banus, in the gated and 24-hour security development of Sierra Blanca Country Club one finds this well build South/West facing four bedrooms villa on two floors and very large basement, which can be used for both a gym, sauna and cinema and or Bodega area. From the entrance one is already welcomed to a hall, leading to an outside terrace ahead, while to the left of same, a living room with chimney and to the right an en suite bedroom, all affording views to the Istan Lake, Mediterranean Coast line, Gibraltar and Africa. The lower floor has a modern and well equipped kitchen with dining room and leisure area as well as bedrooms, who are all leading to a partially covered terrace with large dining table and the well groomed garden, BBQ area and swimming pool. Besides having two chimneys, the house is equipped with central air conditioning both for heating and cooling. There is a car port for one large vehicle or two small ones. 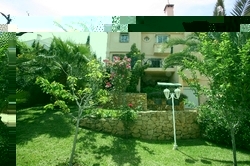 A great family villa for permanent residence or holiday home. This elegant villa has been reformed in 1996 and is located only 200m from the lovely beaches of Marbesa. The mature lush gardens are beautifully groomed and the covered and uncovered terraces are wrapping around the villa leading onto the pool area with BBQ. The entrance leads to a hallway going out to 3 bedrooms with direct access to the terraces and gardens. On the first level there is a large living room with fireplace, the dining room, the pool area, another bedroom and a bathroom. The stairs lead to a solarium with sea views. This quality mansion comes with A/C in all the rooms, pre-installed alarm system, cooking on gas. This villa can be used as a holiday home, permanent residence or rental property! Town of Marbella, and only 5 to its best beaches, this is the ideal little “Castle” to experience the real Spanish lifestyle. 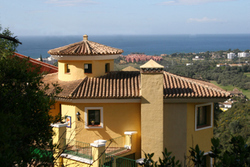 About El Rosario – Very well established residential area with a range of independent family villas with mature gardens; due to its elevated position it also provides super Mediterranean, mountain and golf course views. Close to schools, supermarkets, tennis clubs and several excellent restaurants this is a very popular area with both residents and holiday makers. Set on a gentle hillside this villa is enjoying a south-west orientation plenty of sun and totally tranquillity, despite a central location. The property is distinguished by its living space with a huge open fireplace and separate dining area as well as a library. Set over two storeys, the house enjoys a total of three bedrooms and a fully fitted study. Its sunny south facing terrace leads to a charmingly landscaped garden and the swimming pool. Furthermore the estate offers a central heating system and a garage. This villa, built in 2001, is situated in the lovely urbanisation of Bel Air, Estepona, it is built over two levels to a very high standard of quality. The plot is west orientated and boasts a heated swimming pool, a beautiful garden and views towards Gibraltar and Morocco. The villa offers a generous and spacious floor plan with high quality equipment throughout. At the moment, the villa is divided in two areas, the ground floor and the upper floor. The upper floor has two bedrooms, two bathrooms and a living area with a kitchen, a perfect rental opportunity and is rented out at the moment. Features are marble floors, under floor heating, a fireplace as well as solar panels. REDUCED FROM € 985.000 TO 795.000! 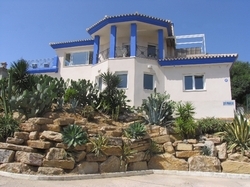 This villa, finished in 2002, is situated on the hills above Elviria on a fantastic private plot. Fitted and built to high quality, the main building offers a large fully fitted kitchen, a living room with fireplace and access to a huge covered terrace as well as three bedrooms. High quality German windows with mosquito screens and Grohe fittings in the bathrooms. With full gas central heating and air conditioning in the bedrooms. Furthermore there is a guesthouse, a big garage with a guest apartment and a swimming pool on the plot. Surrounded by greenery, in a peaceful setting but just ten minutes drive away from the centre of Elviria and several golf courses – La Cala Golf Resort amongst others. This villa is located in the quiet and residential area of El Rosario and within walking distance to all amenities, tennis club and restaurants. The villa is well connected consisting of two separate units, which can easily be converted into a single villa. The entrance level comprises an open lounge with access to a covered terrace with BBQ, leading into the garden with pool, an American kitchen, three bedrooms and two bathrooms, with the master bedroom en-suite. On the first floor there is another spacious lounge with open fireplace, an American kitchen, the master suite and two further bedrooms sharing one bathroom. Magnificent mature gardens with big pool and a bar invite to enjoy Mediterranean living. A well priced villa with great rental potential!